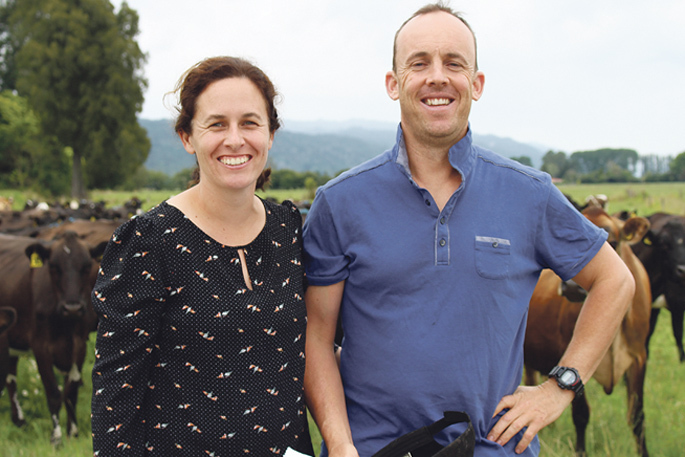 Katherine and Fraser McGougan on their Whakatane dairy farm. Photo: Bay of Plenty Ballance Farm Environment Awards. Fraser McGougan has seen many farmers lose interest with dairying. He’s not one of them. He and wife Katherine purchased his family’s farm in 2011 following a succession plan instigated with foresight by parents Gavin and Charlotte McGougan. Now – having spent the last seven years paying down debt and improving profitability on-farm – they are more focused than ever on the dairy industry. And while their vision remains clear that the 430 crossbred cow twice-a-day milking operation on 137ha effective near Whakatane remains profitable, Fraser is also implementing changes on-farm that will benefit the environment. And recent years have brought a change in focus “into looking at environmental best practice and how the farm can still be sustainable, viable and economic in 100 years’ time”. In their first year owning the business they created a 34-bail rotary by retrofitting an old platform made for 28 cows. Since then they’ve installed technology to improve milking efficiency and save on water and power use. “We’ve put in automatic cup removers, bail restraints, automated teat spray, compressed air to purge the milk lines so you require water. We’ve also installed a heat recovery unit and snap-chilling for milk cooling. “I did the milking for seven years solid; now I have two staff it’s about making the one-person shed a nice work environment for them,” says Fraser. In fertiliser application, Fraser has focused on precision farming using nutrients smarter to encourage grass-growth. Recently, Fraser has contracted individual paddock soil sampling. He says it’s an initial expense but makes a huge difference in saving on total fertiliser spend and time. And it’s really eye-opening. Fraser says while its sounds like they invest lots, he insists they’ve been smart investments that serve to increase profitability on-farm and the environment. In 2016 they won Best People Leadership in the Dairy Business of the Year awards, plus Low Input with Best Financials and Best BOP-Central Plateau Farm Performance. In May 2018 Fraser was named one of 15 climate change ambassadors, the only farmer from the BOP. He’s now on an 18-month commitment to champion the climate change cause as part of the Dairy Action for Climate Change. “With climate change I believe there’s something which is happening, and we’re going to make a difference and we’re going to make a positive change for our world. “At the start I had no experience – but I think I provide different points of view and enthusiasm and it’s neat talking about issues to ministers but also portraying what issues us farmers have. Because it’s not all one-sided.